The king of graphics card declared continent's finest hardware. 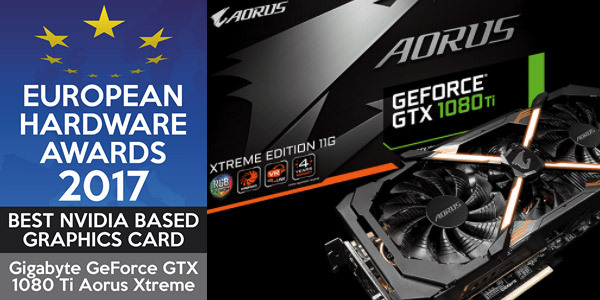 GIGABYTE, a leading manufacturer of motherboards and graphics cards, is proud to announce that the AORUS GeForce® GTX 1080 Ti Xtreme Edition has been recognized as the best NVIDIA-based graphics card at the prestigious European Hardware Awards 2017. The European Hardware Awards is an annual selection of the very best products available in the market organized by the European Hardware Association (EHA) comprising top technology websites that represent all of the major regions in the continent. Members include KitGuru from the UK, HardwareLuxx from Germany, Hardware.Info from the Netherlands, Geeknetic from Spain, Hardware Upgrade from Italy, Lab501 from Romania, CowCotLand from France, PurePC from Poland and SweClockers representing the Nordic countries. The EHA editorial panel dedicates this honor to recognize companies that produce exceptional hardware products that consumers across the European region can truly trust. The AORUS GTX 1080 Ti Xtreme Edition secured the prestigious victory by outrivaling 10 other finalists in one of the most fiercely competitive categories this year. Designed for PC gaming enthusiasts, the award-winning AORUS card is powerfully built to elevate gaming experiences to the next level. The signature WINDFORCE Stack fans with the exclusive backplate cooling ensure exceptional thermal performance to bring out the best of the Pascal GPU while keeping the card near silent. The patented VR-friendly output connectivity leads the industry to prepare gamers well for next-gen gaming; the fully customizable RGB Fusion lighting on the front, back, and side styles up the rig from every angle. With dominating performance, distinctive aesthetics, and rock-solid durability, it is without doubt that the AORUS GTX 1080 Ti Xtreme Edition was chosen as the winner for this year’s European Hardware Awards.